From the Golden Heart City of Fairbanks, feast your eyes on Alaska’s endless beauty as you travel aboard a luxurious Alaska Railroad train to the famous backcountry of Denali National Park and Preserve. Your two-night stay in the park, noted for its vast scenery of snowy mountains, forests and tundra, as well as its abundant and varied wildlife viewing opportunities, will provide you with much more than any standard park tour. Beneath the awe-inspiring 20,320-foot peak of Mount McKinley, take advantage of the knowledge and experience of our naturalist guides who will share with you their fascinating stories and encounters in the park. You will also have the opportunity to enjoy historical and cultural presentations offered at the lodge in the evenings or to spend some time exploring the natural history library and video collection. Following your extensive park visit, return to the Denali park entrance area to overnight at a nearby hotel. Continue your exciting vacation with optional excursions in the area, like flightseeing, river rafting or an ATV adventure. Say a last goodbye to Denali as you board the train for your scenic southbound journey to Anchorage. We’ll provide a transfer from the airport to your hotel. Take advantage of your free afternoon and evening hours to explore Alaska’s second-largest city. Fairbanks weather can be surprisingly warm in the summer so an evening walk can stretch pleasantly into the night. Optional activities such as a visit to Chena Hot Springs for a soak under the midnight sun or dinner at the Alaska Salmon Bake are highly recommended. Overnight in Fairbanks. During your final morning at the park, enjoy a bit more of Denali’s wild charm with a walk in the area or a visit to the park gift shops for some mementos. 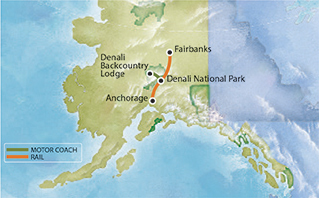 Then board our luxury railcars for your trip to Anchorage. Sit back and enjoy the beautiful scenery along the route, relax with a cocktail in the dome car or purchase dinner onboard for a unique dining experience. Comfortable accommodations await you in Anchorage. Overnight in Anchorage. We’ll transfer you to the airport, where you can still fit in some last-minute shopping or view the life-sized wildlife displays on the lower level before leaving for home with some wonderful stories of your once-in-a-lifetime Alaska adventure!